As temperatures rise so, apparently, do the number of farmer's markets around town. Pack a shopping bag and hit the road to find great vegetables, fruit, and more to stock your pantry for the week and perhaps even find a culinary gift or two to boot. 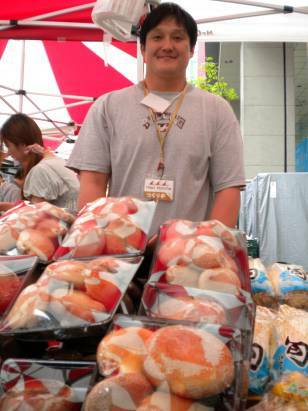 And without further ado, here's a round-up of Tokyo's July farmer's markets for your weekend planning! Every Saturday this month, and if Google translate tells me the truth, there should be sheep and goats there, too! Shearing demonstrations at 11am and at 3pm. Just when you want to think about being warmer. No sheep shearing at this one, but there will be art workshops for kids and plenty of great seasonal organic treats. A little out of the way, but well worth the journey. Every Saturday and Sunday without fail, this market offers up a fantastic selection of seasonal goodies from near and far in Japan. Another every Saturday and Sunday market that promises to be good. I'm hoping to get over there this weekend to check it out for myself. Know of a farmer's market not listed here? Whether it's in Tokyo, Osaka, or Hida Takayama, I'd love to know about it and give it a shout out. (I am a vegetable geek, after all.) Drop me a note and I'll happily add it to my list.